In March, NASDA's ASCANs received lectures and hands on training on micro-gravity science and participated in hypobaric training. In addition, in Houston Texas, they received lectures on Space Shuttle and participated in weightless environment training using a KC-135A jet. 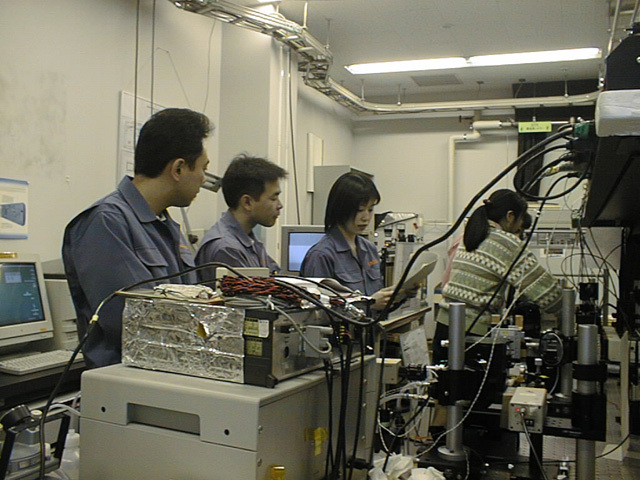 The ASCANs received lectures on basic physics, combustion science, fluid physics, substance science and material science, and conducted crystal growth experiment and material synthesizing experiments in order to acquire knowledge related to micro-gravity science, at Tsukuba Space Center. 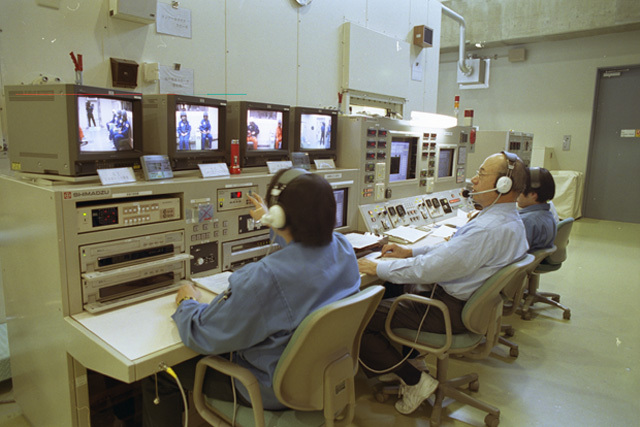 ASCANs received hypobaric training in the hypobaric chamber located in the Astronaut Training Facility, Tsukuba Space Center. 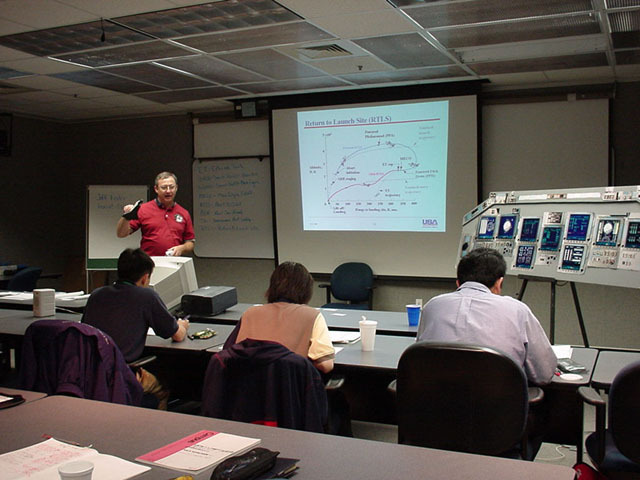 This training was conducted to enable them to understand and experience physiological changes in a hypobaric environment and to acquire means to deal with them. The hypobaric chamber is composed of a low-pressure chamber, data collection system, pressure control facility, air conditioning facility, and operation and control facility. This system can accommodate a maximum of six people to a minimum pressure of 0.2 atmospheres. This training must be conducted before the weightless environment training using NASA's KC-135A. They conducted the training pattern of lowering the pressure from ground level (one atmosphere) to 35,000ft (0.24 atmospheres) and back to one atmosphere again. The ASCANs removed their oxygen masks to experience a low-oxygen environment and the change in night vision, and conducted emergency oxygen breathing training and emergency decompression training. Having finished hypobaric training, the ASCANs participated in weightless environment training using a KC-135A jet in Houston Texas. 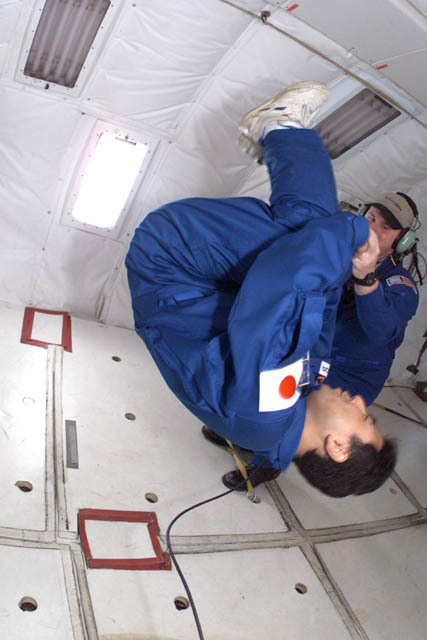 This training was conducted to enable the ASCANs to experience a weightless environment, to understand body movement and control, and physical phenomena. Another purpose was to enable them to understand and experience the difference between the weightless environment utilizing water buoyancy they experienced during the EVA training conducted in February this year. During the 40 parabolas, they experienced weightlessness through body movement and control, and watched various physical phenomena. They also observed motion of balls and tops under weightless environment. A weightless environment is the state of being affected only by the gravity and where no other force is applied. During weightless environment training, utilizing an aircraft, the aircraft is flown in a parabolic pattern, which creates a temporary weightless environment inside the aircraft. To create the maximum period of weightlessness, the aircraft is accelerated to maximum speed just prior to the start of parabolic flight. Its nose is then pulled up suddenly and the engines power is lowered to allow the aircraft to follow a parabolic trajectory. To ensure safe recovery of normal flight, the engines power is increased before the nose is oriented below 40 degrees, and the nose is pulled up to resume normal flight. This action is repeated. The KC-135A jet can generate about 25 seconds of weightlessness during one parabolic flight. People sometimes feel sick, which is why some people call this aircraft the "Vomit Comet." The next training report will be issued in mid May.